Recipe for Fitness: Champion Nutrition Recipe of the Week - Post-Workout Ice Cream! 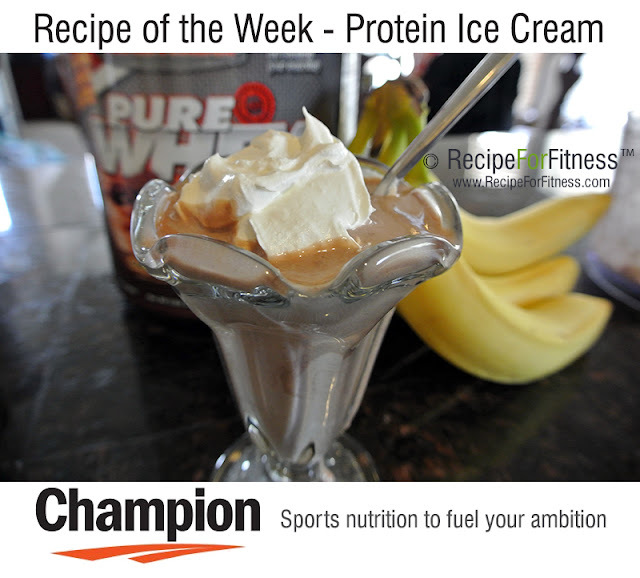 Champion Nutrition Recipe of the Week - Post-Workout Ice Cream! The weather is heating up, and ice cream is on my mind. Not Ben & Jerry's, though - I'm craving my protein ice cream! Ya'll know I have a ton of recipes for protein ice cream, and here's another one you can enjoy post-workout. The natural sugars in the banana will go to work right away to replenish depleted glycogen stores, and the plentiful B6 (can increase exercise induced levels of growth hormone! ), Vitamin C (antioxidant powerhouse), Manganese (key in carbohydrate metabolism), Fiber (key in everything) and Potassium (important electrolyte that helps form glycogen) all work together with the muscle feeding protein to create a perfect post-workout treat! The frozen banana is the star ingredient in this - so when you've got some leftover bananas, peel them, chop them and throw them in a freezer bag and into the freeze. They'll be ready and waiting when you need them. 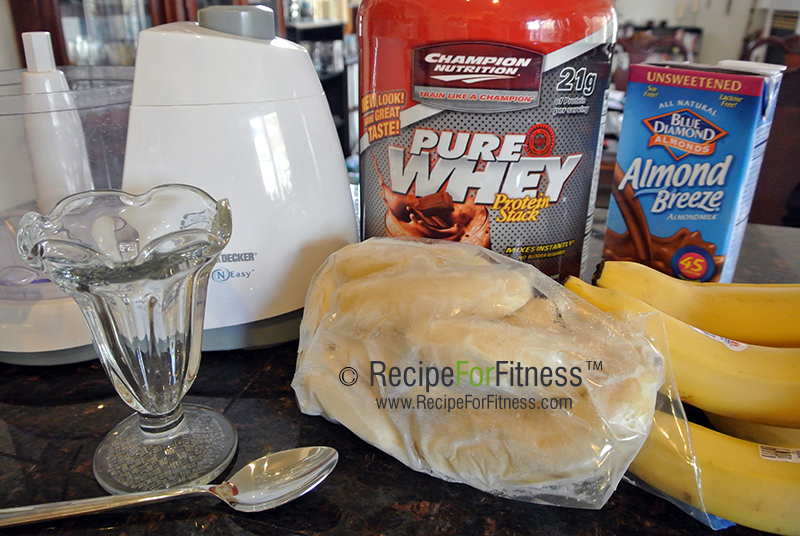 Place frozen banana in a food processor or strong blender. Blend until creamy (takes a minute or two, but hold onto your blender, that puppy is gonna jump all around until the banana processes). 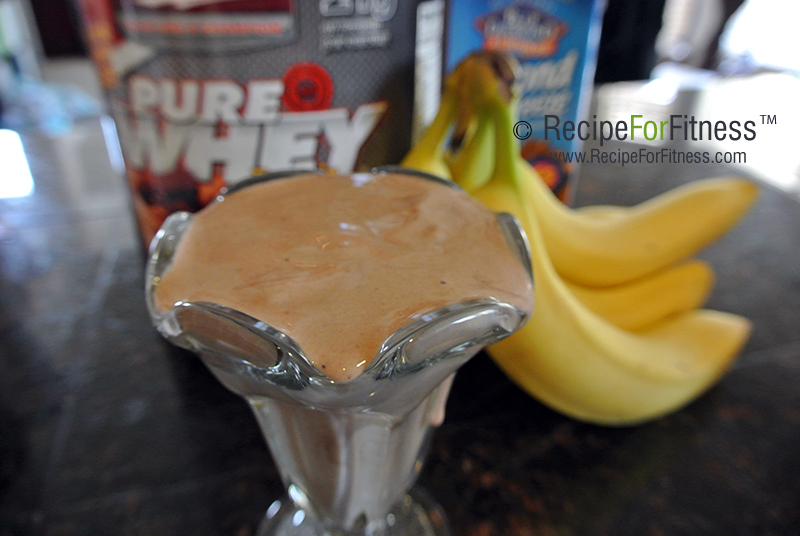 Add protein powder and almond milk, and blend until incorporated. 258 calories, 25 grams protein, 31 grams carbs, 5 grams fat, 4 grams fiber, 16 grams sugar. TIPS: Freeze prepared ice cream for 15-30 minutes for additional firmness. Top with fat-free/sugar-free cool whip.